Today is an indulgence for me. Porsche Cars GB has a German-registered GT3 RS 4.0 in the country for a few days, and has invited me to come and drive it for just a couple of hours. Not long enough to bother with a photographer and, besides, my colleague Adam Towler has already spent more time with the Porsche, on road and track, and is writing a full report for Total 911. So I have nothing else to do but drive the RS 4.0 around the Berkshire, Wiltshire and Oxfordshire B roads, and get lost in the process. Perfect. The drive starts, by necessity, by a blast down the M4 motorway. 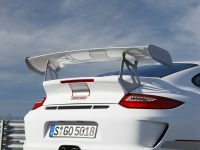 Knowing that a white bestriped 911 with a massive rear wing has ‘nick me’ written all over it, I keep the speed down and am surprised at just how civilised the Porsche is. Quiet it is not, with excessive tyre noise (soundproofing is reduced over that in the previous RS), but I am able to listen to the (admittedly basic) radio in this Comfort-spec car. It’s also got air-conditioning (a no-cost but sensible option). The motorway run also lets me enjoy the 911’s exhaust note. Press the Sport button and the engine howls like an enraged animal. A wonderful, and highly addictive, noise! But this is a Porsche built for the racetrack and winding roads, so I peel of the motorway into the Wiltshire countryside. Part of me is expecting the RS to be a bit of a handful – more racecar than road car – but it’s anything but. It’s a surprisingly easy car to drive, whether I’m pottering politely through a village or pushing hard on the open road. The suspension, despite being fitted with rose joints at the rear, is relatively compliant which is perfect for these bumpy rural roads (not to mention my spine). Sure, it’s firm but not so much so it’s jittering me off line every time I hit a bump; although I can have that if I set the PASM to Sport mode, which is only suitable for a smooth racetrack. Like the 3.8 RS, the steering is wonderfully direct and communicative and does just what I demand of it, with no effort from me. There’s a touch of understeer at times but a dab on the throttle pulls it back on line. Too much of a dab and the back end cheekily hops round on these damp roads – evidence perhaps that the traction control is set to allow you to have a bit of fun (I don’t dare turn it off). But what of that enlarged engine? 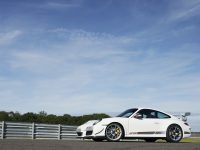 The extra capacity plus improvements to the breathing and other tweaks have freed up an additional 50bhp over the 3.8, given an output of 500bhp – an incredible figure for a normally aspirated engine and the same as that of a 997 Turbo. The power delivery is quite different to the Turbo’s, being more linear, and the engine revs remarkably freely to the 8250rpm limiter, howling in protest as it does so. The power is brutal but, again, very controllable and refined; partly because of the massive 460Nm of torque, so you don’t have to work the gears to keep the engine sweet if you don’t want to. With a 0-62mph time of 3.9 seconds, this is a very quick car, I accelerate hard out of corners then lean on the superb ceramic brakes (a worthwhile option) as I hit the next corner to repeat the process. It’s addictive fun. And even after some hard driving at high revs, the car’s economy gauge is reading a respectable 15mpg. A racecar for the road? Not at all, this is a Porsche for people who want to pretend they have a racecar but really want a car they can safely and comfortably drive without having to have Senna-like skills. Any complaints? Only that two hours wasn’t long enough behind the wheel of this wonderful machine! You can read our full report on the Porsche GT3 RS 4.0 in issue 77 of Total 911, on sale 13th July.